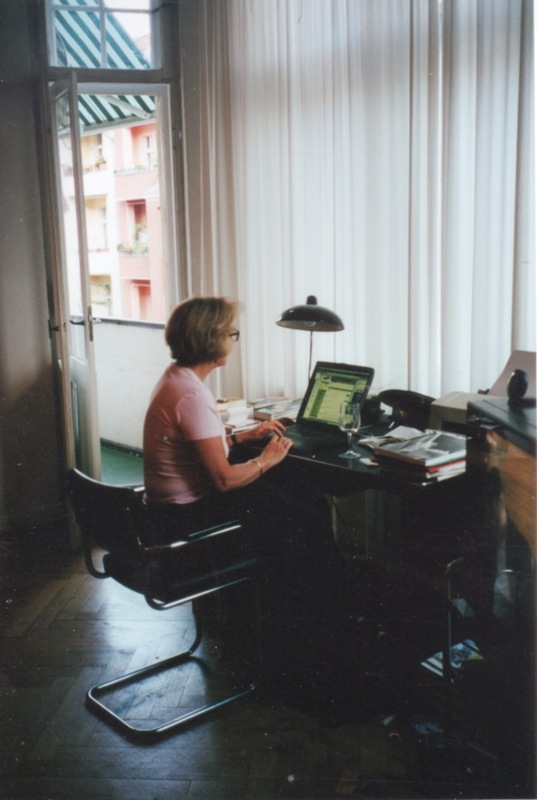 Anne MacDonald in her Berlin apartment. Photo: Maureen Keefe and Michael Penhallow. MY FRIEND Anne Marie MacDonald passed away this month. I’m thinking out loud, speaking to her the way I would in the millions of emails we exchanged over the years. . . . Really Annie? Is this your idea of finally getting me to write for Artforumyour obituary? But then you’ve always waited patientlymaybe not so patientlyfor me to come around. I first met Anne in 1986, when she exhibited the Black Paintings at Artspace in San Francisco. I think it was their second show and the curatorial debut of John McCarron. Gentle and brilliant John; she was so devoted to him. He was only thirty-four years old when we lost him to AIDS. His death had a huge impact on her. The neighborhood was so alive, we hung out with the likes of Kathy Acker and Dennis Cooper, and Anne wanted to create opportunities for writers to make some money. She was annoyed that writers were always getting the short straw while the painters were getting rich. So, when she asked me to write about my paintings for Shift, a magazine that was Artspace’s latest publishing adventure, I suggested that Edit DeAk interview me. Anne flew Edit from New York to San Francisco and gave her an advance of a few thousand dollars, which unbeknownst to us was blown on smackbut Anne wasn’t fazed. (I still have those brilliant taped conversations.) Years later, sometime in the mid ’90s, she decided we better publish a serious book and told me she wanted to start her own publishing company. Anne envisioned launching Artspace Books with a series of original collaborative projects between visual artists and writers, starting with my book. It was then that we started to look for an author to parallel my work, though years passed to no avail. The book triggered a much larger body of work, culminating in an exhibition at MASS MoCA. Anne also arranged a journey to Berlin that resulted in a relationship with the Jewish Museum, involving a body of work called Judenporzellan. In 2013, just before the MASS MoCA opening I flipped my car over. Annie texted meHow horrible. Are you still in the hospital? What can I do? I don’t want to lose you. Me first. Love you too much. Anne was generous but it wasn’t just about moneyshe jumped into the pool with us. For me, it was a long caring friendship, with disappointments and successes, organically creating platforms and pushing envelopes. I just got out of the pool after swimming for an hour. Once I am in I don’t want to get out. It comes from when I was young. I was a swimming champion. I practiced everyday except for 2 weeks a year. My coach even put lanes in the Lake so I could swim in the summer. It was the biggest lesson I learned as a young girl. You win by merit. Nothing else. I was so spoiled by my father and needed to learn this. Now I have to admit my pool is heated to 90, like a very large tub. I was given 2 years tops. I’m at 1 1/2 right now and fading. I am not worried or afraid or any of that. I’ve had a great life. My family is doing really well. My grandson graduates from high school soon and is going to Yale. My friends are all doing well too, so how much can I ask for. Don’t stop telling me how much you love me because I feel the same way about you. I think of all our adventures together. How you always made the best for everyone. Look at that guy you bought a tuk-tuk for. Your name is in lights in Delhi. Izhar Patkin is a painter and sculptor living in New York.